After visiting back home in Berwyn and before we came back to our California home, we made a quick stop to Denver. It gave us a chance to visit Romy's relatives, Jeraline and John and their daughter Joanna, who live in Golden, Colorado, and also to meet up with Courtney and her mom to go hiking around Rocky Mountain National Park. 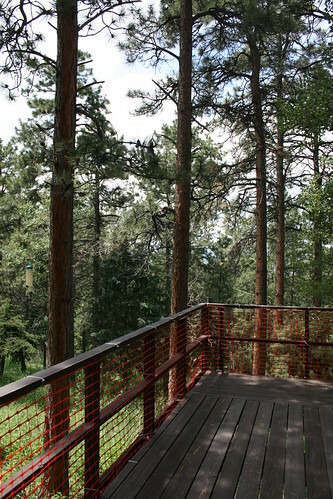 View from the Thurston's deck in Golden Colorado. Beyond the trees you can see more snow-capped mountains. 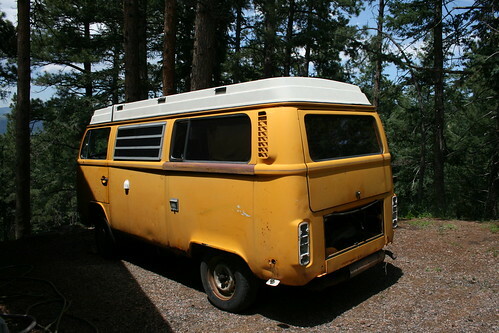 Romy's relatives in Golden, recently (in June, I think) acquired a 1976 VW Westfalia Bus. The whole Thurston and extended family has started restoring it so that it could get back on the road. John plans to drive it to Door County in Wisconsin in October or September for a bike ride through the county. When we arrived at their place on July 11th, Romy helped them do some minor work. But then it was time for lunch, and we went to Buffalo Bill's and had a buffalo burger. Mmmmmmm. The 'dragon wagon' which the Thurston family is fixing up. In the afternoon, Romy continued to help here and there with the bus, and then we went on a drive through the local mountains in John's Miata convertible. Sadly, we had to leave that evening, but we would be back a few days later to help and get the bus running (which it did on Tuesday)! 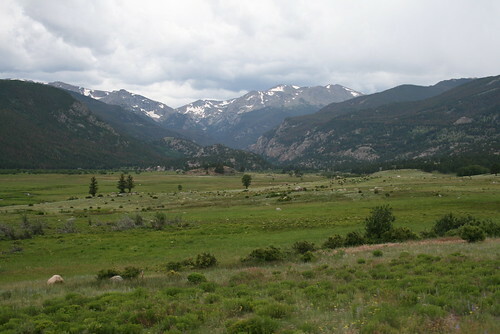 We went off to pick up Courtney and her mom at the airport, and then we all drove to Rocky Mountain National Park that night. We camped in the KOA in Estes Park. The next morning, Courtney, Romy, and I packed up all of our stuff and headed to the back-country permit office for the national park. 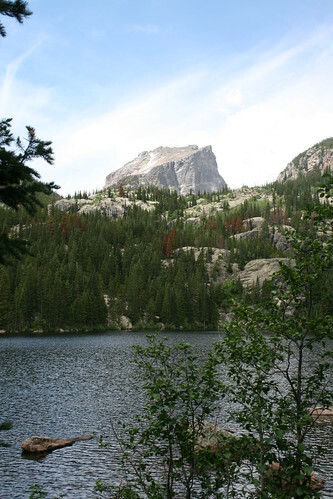 We picked up our back-country camping permit, and bear vault to store our food in, and hit the Fern Lake trail head to hike the Bear Lake Loop on the East side of the park. 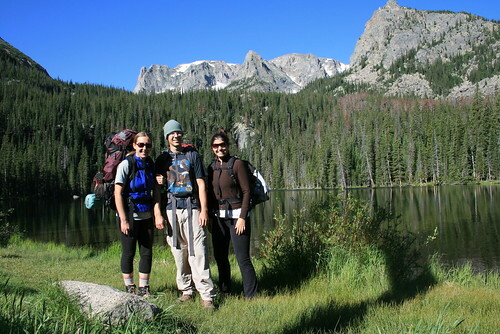 Me, Courtney, and Romy starting our hike to Fern Lake. When we started hiking, it was sunny and warm, but afternoon thunderstorms were rolling in. We hiked through an aspen and pine forest, with abundant wild flowers and wild roses for about an hour before we made it to "The Pool," where it started raining. Although we didn't like the rain, it wasn't too bad, so we stopped under some trees out of the rain, and had our sandwiches that we packed for lunch. 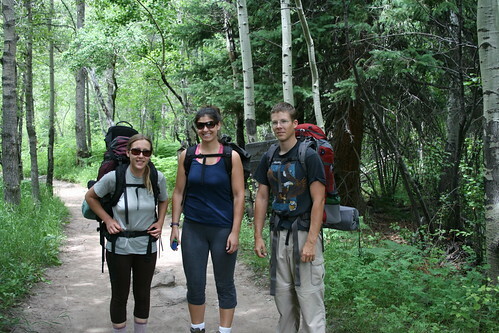 This was the last time we would see a good amount of other people until the end of the hike at Bear Lake. When the rain stopped and we finished our lunch, we continued on the trail. The next leg to Fern Falls was really tough because it was constantly uphill. We were breathing pretty had because of the elevation. We were over 8,000 ft. and climbing through pine forested mountainsides. Courtney and Romy hiking to Fern Lake. 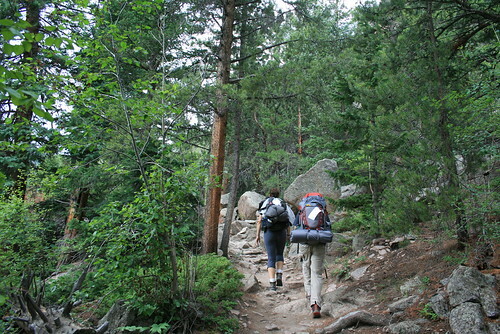 When we reached Fern Falls, we took a short break, but soon continued on the uphill climb to our back-country campsite at Fern Lake, which stands at roughly 9,500 ft. We were getting more and more tired, although the hiking would have been pretty easy at sea level. By the time we reached the campsite, it was still cloudy and drizzling. All three of us set up camp in the forest, and made sure to hide the bear canister with all of food and toiletries far away, at least 70 feet away from the tents. The bears can still smell the food inside, but it is near impossible for them to open it up to get to the food. The bear eventually gives up and leaves the canister and your camp alone. 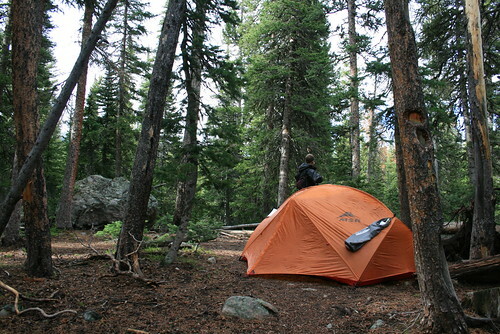 Once a bear learns that it can get free food at a campsite, the bear becomes dangerous because it will always come back. Bears that never learn that they can get food from humans at campsites will stay healthy and wild and will most likely not bother anyone camping in the back country unless they feel threatened. Our campsite at Fern Lake. 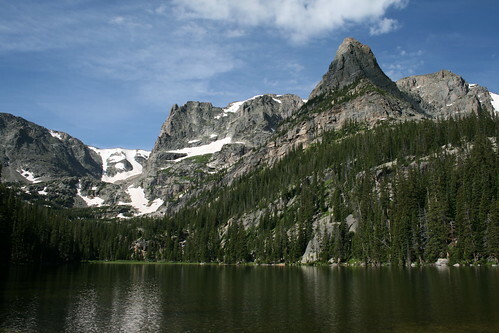 Once we set up camp, we hiked an off-shoot trail to Spruce Lake, another small subalpine lake. When we got there, the thunderstorm clouds started clearing out and gave way to blue skies. This made us really happy! In the area, the stream we followed had a lot of trout in it. I tried poking one with a stick to see if it would be easy to spear one like the Man vs Wild episode, and the fish didn't move! I poked it and it didn't even care! The next morning we woke up to clear skies. Me, Romy, and Courtney in front of Fern Lake. That evening, when we returned to the campsite, we ate and then checked out Fern Lake. There we met two other campers from Ohio and helped them cook their dinner. Once it got dark, we hurried back to camp and fell asleep. We were pretty tired. We hiked a total of about 5 miles that day. Romy and I at Odessa Lake. Another view of Odessa Lake at 10,020 ft. 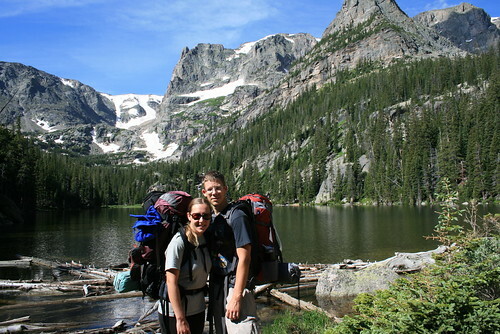 The next morning, we continued our hike another 0.8 miles uphill to Odessa Lake, which stood at 10,020 ft. This lake was more picturesque because of the larger mountains in the background. Some people we saw there jumped in for a quick dip, but although it was hot out, the water was still too cold for us! We only stayed for a few minutes to enjoy the views, and then went back on the trail where were kept going up, up, and up! 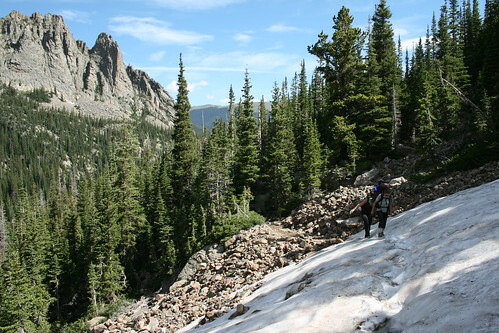 After Odessa Lake, the trail took us high enough that we had to hike over some snow! The hike after Odessa Lake was my favorite part. 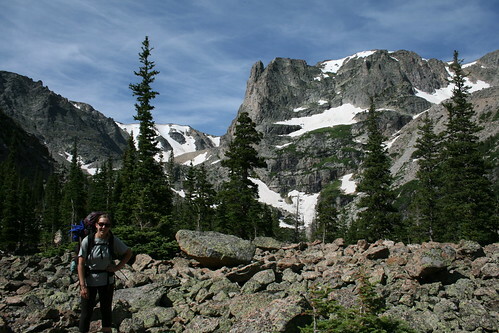 We climbed up near the edge of the treeline at over 11,000 ft. The views were spectacular, and we saw snow covered peaks with waterfalls, tundra and wild flowers, and sweeping views of some valleys below us. We even had to cross some patches of snow which didn't get a chance to melt yet, although it was mid-July. The trail became pretty exposed with little tree cover in some areas, but the weather was fine and we hiked on at a leisurely pace. Jenn taking a break at over 11,000 ft between Odessa Lake and Bear Lake. At roughly the halfway point for our hike that day, about 2.5 miles on the trail, we stopped and ate lunch on a small boulder field. Squirrels and Chipmunks ran around us and we even saw a Pika scurry past! At that point the trail began to go downhill and the hiking got way easier. Not only that, but we began seeing more people hike past as we got nearer to Bear Lake, the end of our hike and also one of the most popular places in the national park. There were more mountain meadows and small creeks that we passed, full of wild flowers until we finally got to Bear Lake. We squeezed through the masses of people as we hiked past the lake and tried to find the closest shuttle bus. Since we started our hike at Fern Lake, and ended it at Bear Lake, we needed to get back to the car by shuttle bus. Luckily one left right away, so we hoped on it and it felt good to be sitting down on a cushioned seat. The shuttle drove down the road to a main station (Park and Ride) where we transferred to a smaller shuttle. It took us back down another road where we parked our car the day before at the Fern Lake trail head. We got to the car just as it started to rain on us! Like clockwork, the afternoon thunderstorms rumbled over us. The afternoon thunderstorms roll in as we made it to the Fern Lake trail head. The storms passed quickly and we were already on our way to Old Fall River Rd., a dirt road which climbed to over 12,000 ft up to Trail Ridge Road (Hwy 34), the highest continuously paved highway in the US. On the way we saw Elk and Marmots, and beautiful mountain views. 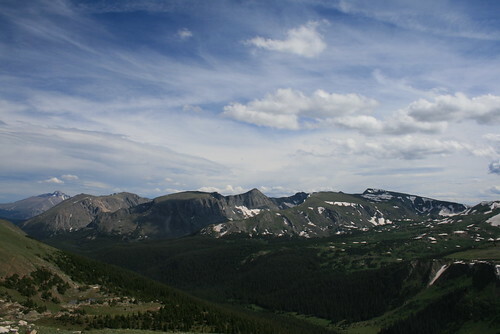 Then we spent the rest of our last day in the park driving the Trail Ridge Road back to Estes Park, where we camped out for one last night before going back to Denver and Golden. 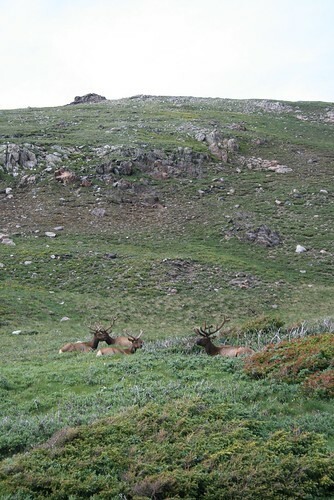 Elk resting at nearly 12,000 ft on Old Fall River Rd. 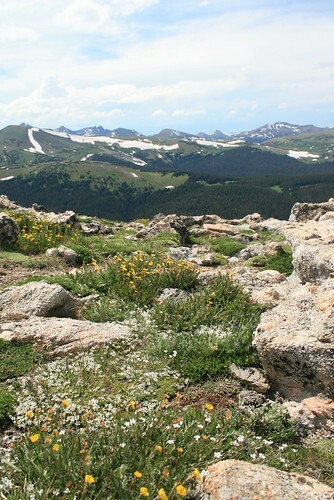 Tundra, wild flowers, and huge mountains off Trail Ridge Rd.